#1 Oikos (household/family) – an extended family on mission where everyone contributes and everyone is supported. The church is not like a family IT IS A FAMILY! #2 Huddles – These groups are the foundation of an MC, creating space for grassroots discipleship/transformation and leadership development. All leaders will be part of huddles at some level. #3 MC Defined: A Missional Community can range from 2 -40 people who are seeking to reach a particular neighborhood and/or network of relationships with the good news of the Kingdom of God. Committed people : Size matters! These are small to mid-sized communities, (multiple MC’s make up the whole of the church). Small enough to care – An extended family where everyone can be known, unlike when folks eventually gather as an entire church. The size of a “house party” where guests can feel welcome (and check things out with less social pressure and more anonymity than traditional small groups) and easily become part of the family when they are comfortable (even if they aren’t committed to the way of Jesus). Organic and Organized – MC’s have weekly gathering times (formal), but ought to naturally create inclusive spaces for people to party and eat together. Meals at various homes and regular parties are some examples of the organic life of an MC. Lightweight/Low-maintenance – MC’s should be inexpensive to operate, easy to plan, and not an attempt to replicate the worship experience that happens at a Sunday Gathering (takes too much effort/resources). Energy should be placed on discerning opportunities for mission within a context and for caring for the needs of the community. Plans should be guided by oikos-style “family rhythms” – Everyone contributes, potluck style, everyone cleans up, etc. Multiple Teachers Equipped and Unleashed – Spiritual conversations will be part of MC’s formal times together. Those with teaching gifts will be equipped to share the load when it comes to preparing conversations each week. Recognized teachers who want to teach will attend monthly equipping meetings to continue to sharpen their skills and to remain in step with the vision of Pangea Communities. The point – “It’s about learning to live a missional lifestyle together, not attending a series of missional events” (Mike Breen). 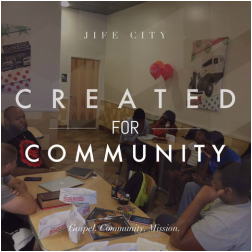 Up/In/Out Rhythms –﻿ Up: relationship with God (not because God is in the sky, but because God is enthroned over all creation), In: loving one another in community, Out: justice, peacemaking, and relational invitation into the way of Jesus. These are not “events” but become the essence of “family rhythms” that define the MC. Accountable Leader(s) – MC’s will have clear facilitator/leaders who help organize and guide the life of the MC. These leaders are accountable to other MC members and especially to the larger church (Pangea Communities). Low Control – The vision for the MC comes from the leaders within that particular context, not from the church leadership (with the exception of certain values and basic structural expectations that extend to all MC’s). High Accountability – Central church leadership is very involved in helping MC leaders carry out the vision that God has given to him/her and their community. Community – We choose counter-cultural relationships guided by love.